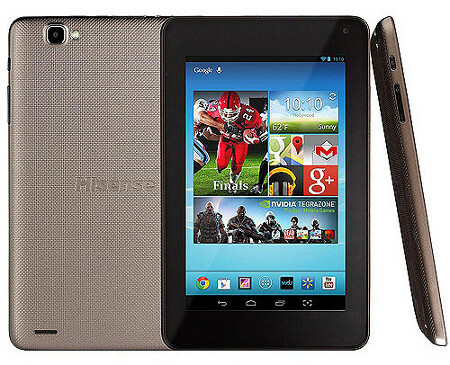 Toward the end of last month Walmart started selling a new tablet called the Hisense Sero 7 Pro. What makes it unique is the simple fact that it has all the technical specs to match the most popular 7-inch tablet of the past year, the Google Nexus 7, while beating it on price by $50 and adding a bunch of additional features on top of it, most notably a microSD card slot, mini HDMI port, and rear camera. I stopped by Walmart a few weeks ago and they had the Sero 7 Pro in stock so I couldn’t resist picking one up to review, which I just finished up today. Hit the link below for the full review and video to see how the Hisense Sero 7 Pro stacks up. Do you own the 7 inch NOOK HD? I know you own the bigger model. I would assume if you did, you would consider that display better? Nope, I just have the HD+. I do think the Hd’s screen is a little better given the higher resolution screen, though. I’m hoping the next round of 7-inch tablets can at least match it. We were given a Hisense television when we bought a car a few years ago. It was our first HD tv and we liked it, but have since gone onto another bigger tv. We gave our daughter the Hisense when she moved and she is happy to have it. Our only issue with the tv was it wasn’t smart, which it wasn’t supposed to be. I wonder if buying the first generation of this tablet would be wise or should I wait. Nice dilemma to have. Thanks for the review. I love this site! A very good review of the Hisense Sero. You raised a concern about its screen brightness (no decent adjustment levels). Would this be annoying for streaming a movie or occasional net surfing? Luckily, I do my serious reading on an e-reader (Pocketbook 602) – much better battery life than any tablet. So for me, the Hisense still seems like a good deal ($149, microSD card slot, front/rear cameras). Your opinion on whether the screen brightness would be a problem for anything other than reading? Also, what is the screen dimmer app you said you installed? The screen brightness isn’t much of an issue when using a screen dimming app like screen filter or screen adjuster. That’s a pretty common problem with Android tablets actually; I have to use those apps frequently for night reading. This seems like a good cheap tablet for ereading. I think I might get this. This is great tablet. I have great vision so brightness is not a problem for me. This tablet is plenty bright. For the price this is the best 7in tablet on the market hands down. I love it. I bought the Sero 7 Pro a couple weeks ago. It’s my first tablet and having the pdf manual available has been a godsend as I wasn’t used to Android. I just love this tablet. Took it on vacation and had no trouble connecting to wi-fi, loads web pages fast. The battery lasts several days as I don’t have it on constantly. My sister was so impressed with it that she’s buying her own! Yeah I was impressed by that PDF manual too. It’s the most detailed instruction manual I’ve seen for an Android tablet, which is good for those new to the system because a lot of things aren’t very self-explanatory.